Gina Marie, an exhuberant actress who advocates experiencing "life with joy" but who is now wheelchair-bound following an accident, is the first recipient of the Chuck Riley Memorial Voiceover Scholarship, established by VOCareer.com to help physically disabled or financially disadvantaged talent pursue a voice-over career. The scholarship was presented to her live tonight at the VOICE 2010 international voiceover conference in Los Angeles, by Adam Goodman and Gabrielle Nistico of VOCareer.com, during the opening night Red Carpet Reception. “Gina is a lovely, talented and very likeable woman. We are so thrilled to be able to make her dream of becoming a VO talent a reality," says Nistico. "We could not have found a more deserving applicant to honor Chuck’s memory and give back to the industry we love so much,” she adds. Born on the Fourth of July, this firecracker is thrilled to embark on a career in voiceovers," says Nistico. She has over 19 years of performance experience in music, theater, on-camera acting, and dance. Previously a musical theater major and education minor on a dance scholarship, her life changed following an accident when she was subsequently diagnosed with a neurological disorder. She currently resides in Souhern California. "An accomplished actress who now relies on a wheelchair for mobility, Gina is enthusiastic about the opportunity the voiceover field offers and thinks it is wonderful to work with creative individuals who are open to seeing beyond limitations," says Nistico. “We all have challenges ... some are visible, others are not,’’ Gina says. She considers the scholarship a blessing which will enable her to do just that. For the first recipient, VOCareer.com will provide six voice-over business lessons valued at $1,500, plus six voice-over performance lessons valued at $1,500, a copy of the book VO 101 (valued at $30), and a fully produced voice-over demo (valued at $700). The 2010 scholarship winner also receives. A ½ hour of legal / business consulting with attorney / voice actor Robert Sciglimpaglia. A copy of the Edge Studio Industry Guide Book. A 30-minute remote support session valued at $75 from El Dorado Recording Services and Don LaFontaine Voice-over Lab designer and co-founder George Whittam. 2 free hours of VO marketing / social networking coaching from Trish Basanyi of Voiceovers by Trish. The Power of Five - the Fundamentals mp3 and study guide by Vanessa Hart of HartSounds Studio. A spot in an upcoming class with audiobook narrator Scott Brick. A web site designed by Jes Coolbaugh of Corporateonlinemarketing.com and Jes C Productions (valued at $750). The entire audiobook collection from voice actress and coach Julie Williams. A full, all access gratis pass to the VOICE 2010 conference (valued at $697). VoiceActing Academy 8-week Performance Workshop in San Diego (valued at $697). VoiceActing Academy Voiceover Business Masters Class (valued at $1,997). 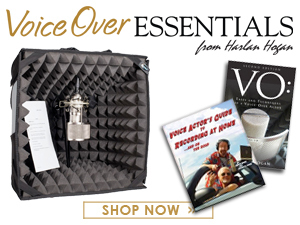 The Voice Actors Guide to Professional Home Recording e-book (valued at $35). Demo and Marketing Magic e-book (valued at $25). The Art of Voice Acting, 3rd Edition (valued at $30). Applications for the 2011 scholarship will be accepted beginning in July. For details and to contribute to the scholarships, please contact Nistico at gabby@VOCareer.com; 704-405-2100. Also visit the web site at www.VOCareer.com. The word “voice” is both a noun and a verb. Biblically, a “still, small voice” is how the Holy Spirit is described. When our personal life is at a crossroads, we’ve been taught “listen to your inner voice” for direction and guidance. As a tween, I was admonished, “watch your tone, young lady!” and learned that subtle changes in the voice can convey different meanings even when we are saying the exact same words. The concept of "Voice" is powerful and has many applications. Voice is more than what occurs when we manipulate our breath to create sound and speak. It is a tool that we can use to communicate with one another. Voice allows us to relate information, thoughts, ideas and emotions, in order to connect with another individual or group of people. Just hearing the sound of the right person’s voice can be a reassurance and make us smile. My family claims that "Hi" was my first word, and my experience with voice has continued from there. As far as vocal performance, I began singing in church at the age of five and later also joined the school choir, auditioned and performed with Genstar Symphony Choir and numerous musical theater productions in our community. While my first love was dance and I devoted myself to the study of classical ballet, music has always been an integral part of my life. It is because of my interest in music that I was first introduced to the voiceover field. While I was taking a radio class at school, our professor Meg Banta-Ford, covered a chapter on being a Voice-Over Talent and I was fascinated. Previously, a dance scholarship recipient, musical theater major and education minor, my life circumstances changed after an accident, when I was subsequently diagnosed with a neurological disorder. As an accomplished actress who now relies on a wheelchair for mobility, I became enthusiastic about the field of opportunity which voice-over offers someone like me; so much so that for my birthday in 2008 my mother enrolled me in a two-day workshop at our community college. This is where I met Jill Lesley Jones and had the opportunity to record my voice for the very first time. Sadly, the second day of the workshop my mother was unexpectedly rushed to the hospital and has since passed away. My personal goals, dreams and creative pursuits were put on hold while I, as her sole survivor, focused on what needed to be done. 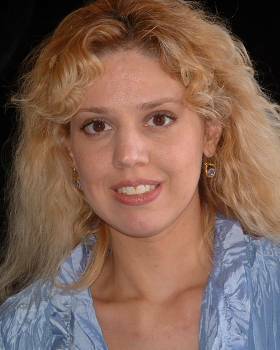 Recently a fellow actress invited me to have my voice evaluated by Heather Costa, her vocal producer and coach. Afterwards, Ms. Costa emailed me this review "Gina has a wonderful, sweet, honest voice that is delicate, friendly and has a great smile. Her voice is soothing, captivating and records well." She also asked me to join her Such A Voice training program. Since my income is limited to an SSI benefit (State Disability), financially it is not a possibility, at this time. My enthusiasm for voice-over however, has been reignited! Voice-over is an under-recognized art which the Media and Entertainment Industries rely on to exist. Listening to a sampling of Mr. Chuck Riley’s work, I heard a dynamic example of how one person can use their voice to engage an audience. Voice-over artists with the talent and training have the ability to inspire, motivate, educate and entertain, while bringing copy to life. This is something I aspire to do in the areas of television spots, movie trailers, educational videos, narrating documentaries and children's books. I was raised with a strong work ethic. My family supported community involvement and were active in volunteering. It is important to me to follow that example. For the past three years my condition was in a flare-up and the health crisis prevented me from working or going to school. I am grateful that things are stabilized now and I can once again participate in life beyond medical appointments and treatments. I believe we all have challenges, some are visible, and others are not. The key is being able to work around those challenges, with dignity. This scholarship would be a blessing to me, as it will enable me to do just that. With only a three-hour window of stamina for functional activity daily, it is not realistic for me to hire a driver to take me to Los Angeles for acting auditions and roles, on a regular basis. I would enjoy returning to Arts Education and teaching enrichment classes for Christian Youth Theater and Youth Opportunities Network, again. However, by the time I hire a driver/assistant (at the required 4 hr. minimum rate) and arrange for the necessary substitutes on the days, my body is acting up and unable to manage, I am at a deficit rather than earning an income. The California Center for the Arts in Escondido has had several job openings I would be well qualified for, in their Marketing, Events Management and Education departments. Given my history with the Center as a performer, volunteer, student intern and former employee who is presently the community advisor on their Access Committee, I would be a strong candidate for employment. While the medical benefits package is very attractive, since there are no pre-existing condition barriers, the positions each require 40 hours+ per week over a four day work week, which I am not physically capable of. I was encouraged recently, when Legoland contacted me to express an interest in hiring me to work in their onsite Education programs, but they were also looking to schedule someone for 40 hours per week, again not a possibility for me. At present, I am left with making earrings and truffles at home, for craft fairs and consignment orders to supplement my fixed income. Becoming a voice-over artist is a perfect fit, since it will allow me to work around my physical limitations and use my natural abilities in a field for which I have a passion. The gift of being trained in both the business and performance aspects of voice-over, along with producing a demo, will empower me to become a contributing member of the economy. Starting a career in voice-over will be very liberating and will enable me to be financially self reliant once again. Pursuing my goals and dreams with passion, is the best way to honor the memory of my loved ones. Experience has taught me to embrace life with joy and celebrate the moments while we can. Being a Chuck Riley Memorial Scholarship recipient will allow me to enter the voice-over field and achieve that dream. It is wonderful to work with creative individuals who are open to seeing beyond limitations. Marcus thank you for your words of advice. CONGRATULALTIONS! A more exciting time you have yet to know and a nicer group of people you have never met. Welcome to the rollercoaster we know as Voice Over, where the peaks brush the clouds and the valleys disappear into the abyss. Just remember to equalize your journey, to top off and adjust your controls for those highs and lows for a more level, more enjoyable ride. Well, that and get some really COMFORTABLE earphones. Best of luck and a big "howdy y'all" from Dallas.